Hey! Lunches + Littles here, and today I am sharing a delicious recipe that will bring a bit more sophistication to any dessert table and is perfect for a summer get-together or just a special after-dinner treat with the ones you love the most! 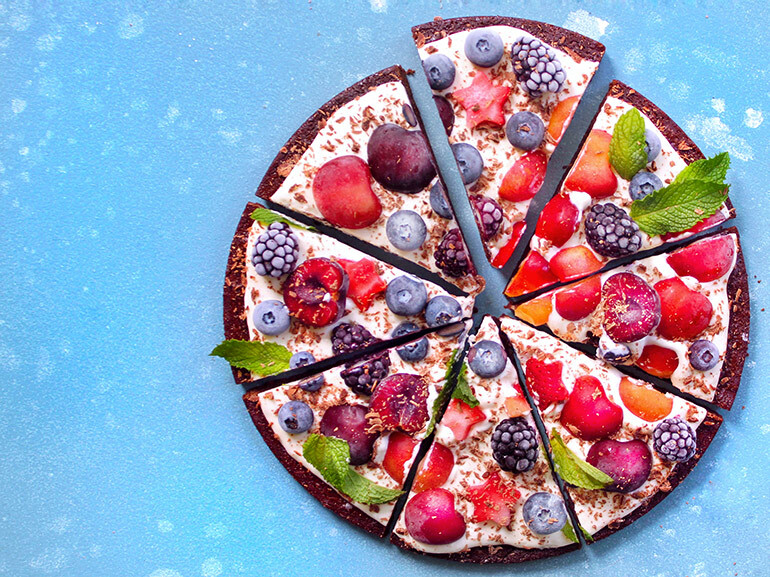 Did you happen to see my Rainbow Fruit Pizza w/ Coconut Whipped Cream that I shared here back in May? 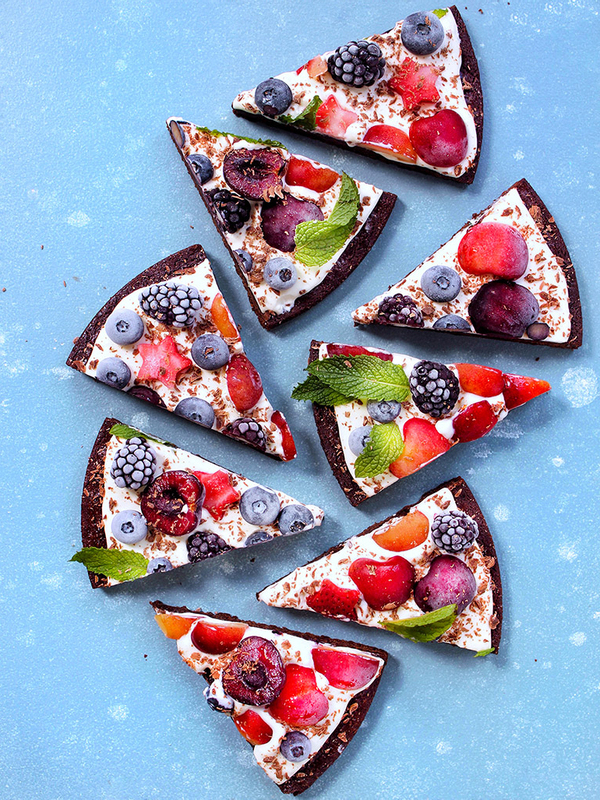 That recipe received a lot of love from all of you on Instagram, and after sharing it, I knew it was only a matter of time before I made another fruit pizza. This time I made it with a chocolate brownie base and covered it with blue and red fruits --- just in time for the Fourth! Now, when it comes to the Fourth of July, we usually head out and spend the day at someone else’s house. But this year we’re having some friends over to our home for some barbeque and other fun (the kiddos will definitely be jumping and splashing! ), and I am pretty excited to host. This brownie pie is seriously delicious. 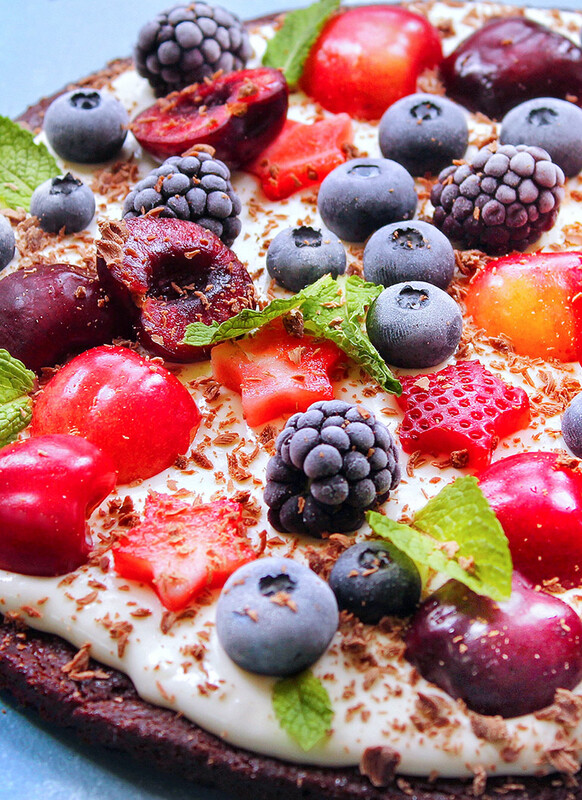 From its chocolate brownie crust, to the fresh berries and chocolate shavings sprinkled on top of the homemade whipped cream... Oh my starzies, it is so rich and creamy and flavorful. And all the fresh berries and cherries really bring a fun and festive look to this treat without any added/artificial colors, etc. What do you think… Doesn’t it look festive? 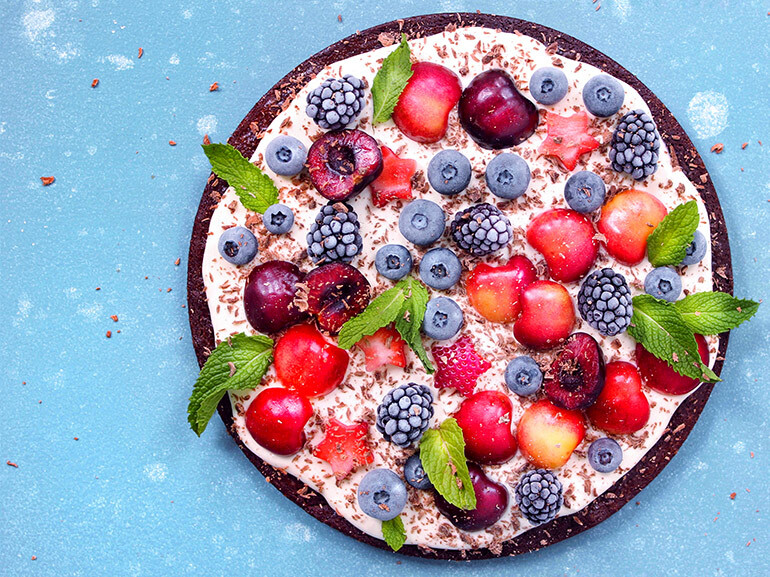 Read on for the full recipe below, and for those of you who may be wondering about the frosted berry look: it is an easy and fun addition (though not necessary) to this pie. - Simply take the desired amount of berries you wish to frost, and place them on a parchment lined tray. Then place the tray in the freezer for about an hour. Take them out and carefully – try and avoid any fingerprints – arrange on top of your pie when it is time. The frosted look will get stronger within a minute or two (though does go away pretty fast after that). Oh. So. Pretty! And, it is important to note that with a few modifications, this recipe can easily be made very allergen-friendly which is always a plus! Vegan, grain and gluten-free and paleo --- see the variations below. So it is kind of the perfect dessert to set out and share with those around you that may not be able to have some of the other options that were brought to the party. *Please note: for the infused whipped cream, your whipping cream will need to be started the night before the day you make the recipe. Read the recipe all the way through to ensure best results! *To make the brownie crust dairy-free/vegan just use a chia egg in place of the egg, and a dairy-free/vegan milk option for the milk. For the whipped cream, just sub in So Delicious Dairy Free's Coco Whip. • Day of prep: pre-heat oven to 350 degrees. • In a medium-sized mixing bowl combine the following dry ingredients, including: almond meal, flour, sugar, cocoa powder and baking powder. Whisk until well- combined. • Next, add the following to you bowl: egg, milk and oil. Use a large spoon or spatula to fully combine the wet ingredients in with the dry until a brownie batter forms. • Grease a springform pan (if you have and want to use one; it is what I used) on the bottom and slightly up the sides. Alternatively, you can just place a piece of parchment paper onto a cookie sheet and grease that lightly. • Transfer your brownie batter to either the center of your paper or the center of your pan and start to smooth it to fill in the pan space of form a circle shape on the paper. • Bake approximately 13- 15 minutes until fully cooked. Then, remove from oven and set aside to cool. *It is important to allow the crust to cool completely. I usually wait at least an hour before putting anything on top. • While crust is waiting to cool, make your whipped cream and prep your fruit. Cut any fruit in half or wash, etc. Set aside. Then, remove your infused cream from refrigerator, and place in a large mixing bowl of stand mixer bowl. Beat until soft peaks form. • Sprinkle sugar over cream, then beat again until soft peaks return. • Smooth whipped cream, or yogurt topping alternative (see above) on to pie. Then, top with fruits, additional mint leaves if desired, and sprinkle with chocolate shavings. Refrigerate until ready to eat. For firmer slices, freeze for up to an hour before serving. • Cut into slices and enjoy!